So, funny enough, I did not use this for what I bought it for because it is too nice of quality where foam cookies are concerned. 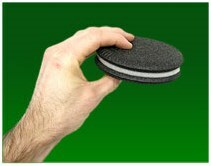 I know that Cookie Bite/Cookie Bite Plus + Kung Food + Overstuft is a great routine that doesn't need much extra work, but my intention was to kick that off when doing magic for my kids buy opening a pack of oreos and having a foam cookie crumpled up and palmed, then pull the stupid thing out of the pack as a joke. But, since the stock photo of this product isn't high-resolution, I assumed I was buying a single foam piece that had two sides died brown. It is actually 3 pieces glued/fused together, and the “cookie” sides are a lot higher quality than expected so I can barely fold the cookie into quarters, let alone scrunch it up in my hand. And though I am sure most pros already think this way - I wouldn’t really recommend adding this sort of gimmick to a routine including Cookie Bite/Cookie Bite Plus, Kung Food, and/or Overstuft anyway. The aforementioned trio of gimmicks rely on the audience thinking you are using an actual cookie to perform these tricks, and when you introduce a gag/prop into a routine it really pulls people out of the magic. All-in-all, this is a high quality product, too high of quality for my needs, and some day I am sure I will think of something interesting to do with it!